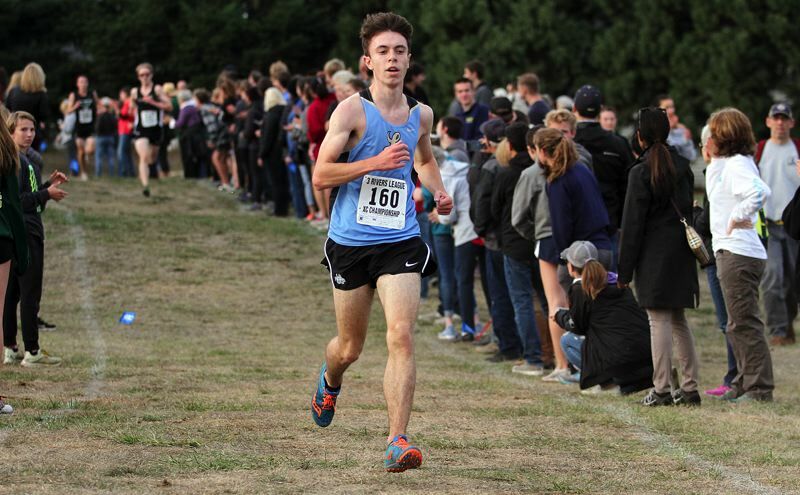 The Lakeridge and Lake Oswego boys cross country teams gave it a run. The Pacers and Lakers — competing in the Three Rivers League district meet at Clackamas Community College on Wednesday — got after the TRL's best in their regular-season finale. The Pacers eventually finished fifth in the field and qualified senior Evan Wheeler for state as an individual, while the Lakers placed seventh as a team. West Linn won the boys team title with 30 points, while second-place Oregon City finished well back at 84 and third-place Tualatin ended up with 88 points; all three teams qualified for the upcoming Class 6A state meet. The rest of the team scoring was Canby at 89, Lakeridge at 112, Tigard at 126 and Lake Oswego at 196. "We were thinking … of going to state and we were going for that, (but) we had some complications," said Wheeler, who finished seventh overall at 16 minutes, 34.40 seconds. "But I think we did pretty well, considering." For Lake Oswego, the Lakers' top finisher was junior Matthew Zimmerman — he finished 33rd as an individual with a time of 17:52.45. "It was good, (but) I might be a little bit sick so I felt really gross today," Zimmerman said. "I was just hoping for a sub 18 (and) I think I got that." After Wheeler's seventh-place finisher, junior Aidan Strealy was the team's next best, taking 17th at 17:01.44. He was followed by senior Wyatt Morris in 24th at 17:20.14, senior Aymeric Feyfant in 30th with a 17:44.38 and freshman Cooper Wood in 34th at 17:55.15. "I always enjoy these big district meets with a lot of people. It's a good cap-off to the season," Wheeler said. "When it comes to big, final races — especially when it's the last race of your senior year — you've just got to let loose, just see what you can do. That's what I did here and I felt pretty good." Also running varsity for Lakeridge were senior James Andersen (36th at 18:01.38) and senior Colin McNeill (47th at 20:06.27). For Lake Oswego's boys, following Zimmerman, it was junior Brogan Deem-Ranzetta (35th at 17:58.41), freshman Dublin Gingerich (40th at 18:13.10), junior Sam Palmer (42nd at 18:22.10) and senior Matt Hofman (46th at 19:32.30). Following head coach Vince Kinney's first season with the Laker cross country program, Zimmerman and the rest of the team's returners are already looking ahead to 2019. "It used to be the seniors that beat me and they were the captains," Zimmerman said. "When we come back next year, I'll be ready to be captain with everything that involves. That would be nice." Also running varsity for Lake Oswego was junior Lance Pancoast (48th at 20:29.68). Next up, along with the teams from West Linn, Oregon City and Tualatin, Wheeler will run in the Class 6A state meet, set for 3:30 p.m. Nov. 3 at Lane Community College in Eugene. In addition to that group, Canby senior Cole Thomas (fifth at 16:25.27) also qualified for state as an individual.